Apigee Edge provides you with a place to store your OpenAPI Specifications. Manage your OpenAPI Specifications, as described in the following sections. The maximum size supported for OpenAPI Specifications is 4 MB. Apigee encourages you to test OpenAPI Specifications that exceed 1 MB on lower-end client machines to ensure the end-user experience is not compromised with specifications of this size. This includes all aspects of the API life cycle where the OpenAPI Specification is used, including design, development of an API proxy, publishing API reference documentation, and so on. Select an organization or your personal space. Specifications stored in your personal space, are available only to you. Specifications stored at the organization level are available to other members of your organization. The current list of specifications and folders is displayed. For a hands-on experience, step through the following tutorial: Create an OpenAPI Specification. Click Develop > Specs in the side navigation bar. Click New in the drop-down menu. Replace the sample specification with your own OpenAPI Specification details. See Create specifications using the spec editor. Import URL to import the specification from a URL. Specify the name and URL when prompted. Import file to browse your local directory for the specification. The specification is added to the list. Click the name of the specification to view and edit it in the spec editor. When you edit an OpenAPI Specification, it has impact down the line, on the API proxy, API product, API reference documentation, and so on. See What happens if I modify a specification? Click the name in the spec list. Edit the specification in the spec editor. You cannot create an API proxy using a specification in your personal space. With Apigee Edge, you can create your API proxies from the OpenAPI Specifications that you design and save in the spec editor. In just a few clicks, you'll have an API proxy in Apigee Edge with the paths, parameters, conditional flows, and target endpoints generated automatically. Then, you can add features such as OAuth security, rate limiting, and caching. For a hand-on experience, step through the tutorial: Create an API proxy from an OpenAPI Specification. After you create an API proxy from an OpenAPI Specification, if the specification is modified, you will need to manually modify the API proxy to reflect the changes implemented. See What happens if I modify a specification?. Navigate to the folder that contains the OpenAPI Specification, if required. Position your cursor on the OpenAPI Specification for which you want to create an API proxy. 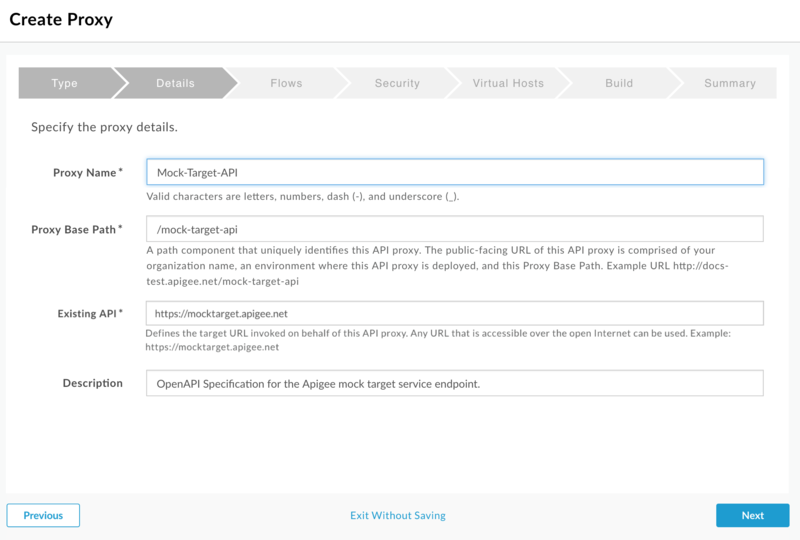 The Build a Proxy wizard is opened and the Details page is pre-populated using values from the OpenAPI Specification, as shown in the following figure. Navigate to the folder that contains the specification, if required. Position the cursor over the specification that you want to rename to display the actions menu. You can organize your specifications into folders to facilitate management and security. To move a specification into a folder, see Organizing specifications using folders. You can delete a specification from the file store when it is no longer needed or becomes invalid. When you delete an OpenAPI Specification, it has impact down the line, on the API proxy, API product, API reference documentation, and so on. See What happens if I modify a specification? Position the cursor over the specification that you want to delete to display the actions menu. Click Delete to confirm the delete operation at the prompt. Delete related artifacts that are no longer needed.